‘Arguably the greatest success of recent governments is to alienate and pacify communities whilst convincing them they are being empowered’. 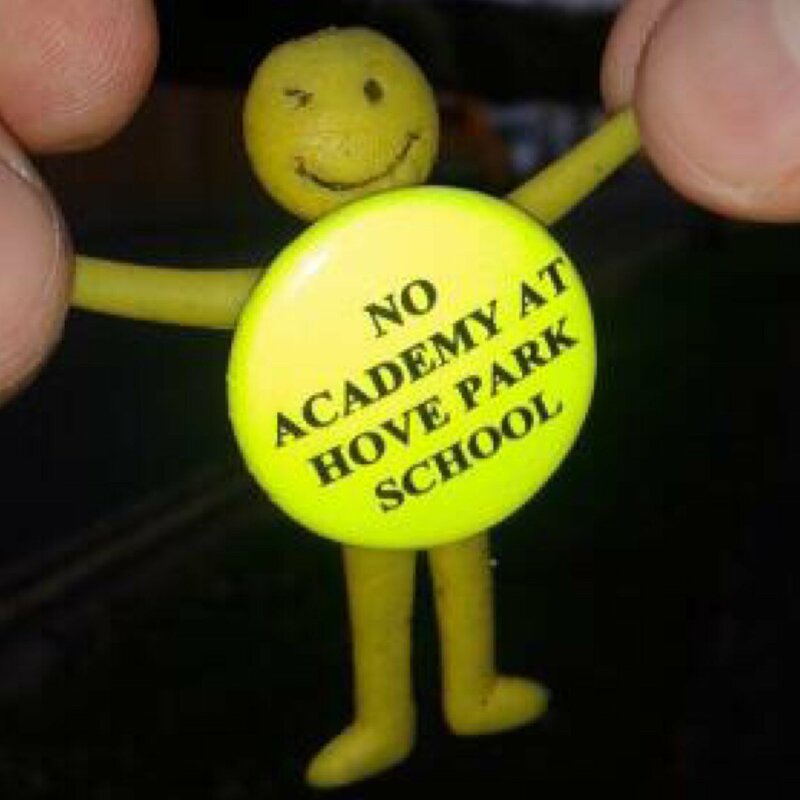 A parent of a child at Hove Park School reflects on the campaign to prevent the school becoming an academy. Hove Park School is doing quite well. We’re not outstanding but we are improving and the school community celebrates that. Indeed the Head takes great pride in the progress whenever he can and in so doing he offers a very strong case for not becoming an academy. If what the school is doing now is working and working well, why on earth change it? This is a key unanswered question for hundreds of parents campaigning to retain a status that is serving the school so well: why change something that works? To what end? In whose interests? Why remove the structures and supports that have facilitated this improvement in order to drift irreversibly into the marketplace? 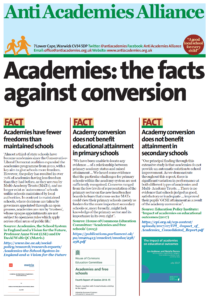 The Head seeks to reassure us by saying that in becoming a convertor academy as opposed to a sponsored academy we have nothing to worry about. I can only imagine he is choosing to miss the point. You can dress a duck in a tabard but it is still a duck. What is interesting in this process however is the extent to which parent interest and involvement is being sidelined. Our school has three vacant parent governor positions. One has been vacant since last year, the other two since April. The Chair of Governors – in a dizzying fit of managerial compliance – has chosen not to bother with the silly distraction of elections to these posts until this ‘process’ is complete. 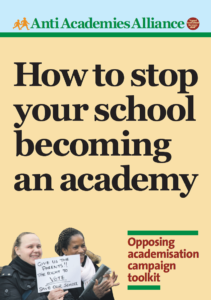 A decision which apart from being undemocratic, unskillful and manipulative quite clearly locates the school not in a process of consultation as it claims but rather in transition. Parent governors it seems are quite a nice idea but only in the abstract, and only if the management team gets to chose them. So there is limited or no representative voice, no dialogue, no response to questions, no clear reasoning for the transition and a process shrouded in secrecy. It seems the schools strategy is to cover its ears and sing loudly, wait for the opposition to wander off and then do as they please. And who knows, maybe that is how communities are shaped these days? 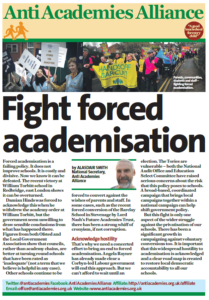 I have been told that sooner or later academisisation will happen. Told not by people who want it but rather from people so inured to the relentlessness of ideology dressed as progress and so tired of the lack of transparency and moral clarity driving their public services that they feel disconnected from them. Arguably the greatest success of recent governments is to alienate and pacify communities whilst convincing them they are being empowered. I have to wonder, and I should say that I have not been otherwise politically active for a very long time, if this cultivated disconnection is increasingly a political strategy? The local Labour Candidate in our marginal (Hove and Portslade) has announced the bizarre position of having no position. Indeed he has tried to turn not having any political views into a something a politician should aspire to– and he’s not even a Liberal Democrat – preferring to wait and see what happens. Is this the backdrop to political exchange now? Taking pride in not acting and hoping it makes you popular? Fortunately the Green led local council have voted to facilitate a parents ballot, something that will at least offer a voice to the community. I believed when I became involved in this campaign that it would evolve into an exchange of principle, politics and vision for the school. I confess that part of me waited nervously to find out things that I did not know that might expose my own beliefs as ill founded or naïve. So far I have found no helpful exchange, I have witnessed no debate, seen nothing that I could offer my daughter as a model for adult informed exchange. Whilst I wait the campaign continues although the school has retreated even further to consider the results of its risible ‘consultation’, behind closed doors, with all the transparency of insular generals in a military bunker. So I’m going leafleting tomorrow. I haven’t done that since the 1980’s. This entry was posted in News, Top story and tagged Parents. Bookmark the permalink.